It’s a very It’s Always Sunny in Philadelphia week, as the Sunny cast kicks off its tour of live The Nightman Cometh performances tonight in Boston, just in time to ring in the show’s fifth season premiere on FX Thursday night (10PM ET). To get the scoop on The Nightman Cometh tour, the new season (hint: Kitten Mittens! Wrestling with Rowdy Roddy Piper! The gang’s naughty Christmas DVD!) 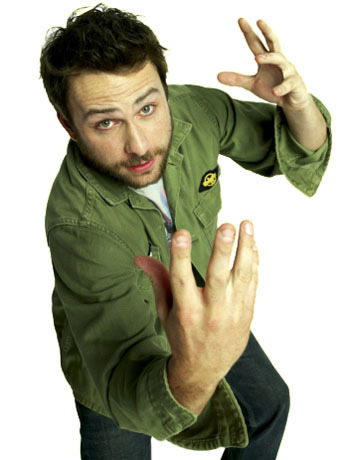 and the next big thing from the cast (the upcoming FX comedy Boldly Going Nowhere), here’s my recent chat with Sunny star Charlie Day, who plays the angry, glue-sniffin’, thermal underwear-sportin’, musical-writin’, oddly endearing Charlie Kelly. Hey, Charlie! Thanks for chatting today. How did the idea for the live performances tour come about? Well, we did it once at The Troubadour in Los Angeles, and it was all entirely by accident. A friend of (Sunny star Rob McElhenney‘s) named Don McCloskey is a musician, and he had booked a gig at The Troubador and asked if we maybe wanted to sing a few of the songs from the various episodes in which we sing on the show. And we sort of agreed, and then The Troubador put up on their Website that the cast of It’s Always Sunny in Philadelphia was going to perform The Nightman Cometh, and it sold out almost instantly. And then we said, ‘Alright, well, now we actually have to do something here.’ So we got together and figured out the best way to do it, and we collectively decided that the best, most interesting thing would be to perform the entire episode like a play, and then the play within the play. So that’s what we did, and it was great fun, and it was a success, so we decided we would take it on the road. Now that you’re moving the performance to these bigger venues in cities like New York and Boston and Los Angeles, will it change? Or will you still be performing the entire episode, with the sets, etc.? Yeah, I think so. We’re gonna put the sets on a bus or van or drive it around to wherever we go. Were you surprised at how the tickets – almost all of them at each venue – sold out almost instantly? I was enthused. I’m pretty aware of the fan base that’s out there … we at the show are very grateful for it. So we’re all just very pleased to see how excited people were, and also excited that we have the opportunity to do this live performance for (the fans). There were many “troll toll” jokes being made on Twitter. (Laughing) Yes, and that’s appropriate. But you guys must feel like rock stars now, as well as TV stars. (Laughing) Well, this is as close as we’ll get to being rock stars, so that’s another fun reason to do it, to enjoy it. Is there a chance that you may do still more with The Nightman Cometh after this? We kind of have the Behind the Music-ish episode in season two where we originally saw (the idea) and now we have the actual show … could there be an episode of It’s Always Sunny about the gang taking the show on the road? Well, it wouldn’t be like the gang to ever make it out of Philadelphia, but … certainly they would aspire to do something like that, and that could make for a pretty hilarious episode. Is that true that we won’t ever see the gang leave Philly? Well, we may or we may not. We don’t want to set down any ground rules so that there won’t be any surprises, but I don’t see big changes for these characters. I don’t see the final season taking place in Miami or something. There’s lots of buzz about season five … Is it true that The Waitress (played by Mary Elizabeth Ellis, Day’s real-life wife) gets married this season? Absolutely, absolutely. There’s certainly a snafu there. And we have a great episode in which we wrestle for the troops, because we want to celebrate the troops coming back from Iraq and Afghanistan, and we decide what better way to do that than to put on a USO-type show, and what’s more American than good old-fashioned wrestling? And Rowdy Roddy Piper makes a guest appearance in that episode and he’s fantastic. So that’s a favorite of mine this season. And there’s a bunch of them that are great this season … we’re going to flash back to 2008 when the Phillies won the World Series and see what the gang was up to that day, and that’s a good one as well. And there’s a flashback to the gang as babies? Well, not in the (regular) season. You will see younger versions of these characters in the Christmas DVD that we’re doing. Is that episode a standalone, or will the Christmas episode be part of season five? That’s a standalone thing, on DVD. And it’s uncensored … it’s pretty dirty. And we’re going to put it out at Christmastime. And is it true that Charlie’s Kitten Mittens come to fruition this season? Yes, Kitten Mittens! What the world has been waiting for (laughing). Yeah, there’s an episode in which my character designs these Kitten Mittens and then everyone (in the gang) tries to think of something they can create and sell in the bar. Haha, yes, well then, I apologize to cats of America. Are you and Rob and (Sunny star) Glenn (Howerton) also working on Boldly Going Nowhere? We are, we’ve been retooling and writing that. Our focus, really, for the last few months has been on finishing (season five) and getting that out and doing this tour, and then we can kind of shift back to that. Is there a premiere date attached to it yet? I don’t think so. We’re still working on it. You guys are co-creating it, writing and producing it … will the Sunny cast also make guest appearances on it? If all goes well with that, sure, I think that’s something that we would love to do. If we pull it off, it will be the kind of show that would have lots of people coming and going every week, so there will be plenty of opportunities for performers. Boldly Going Nowhere has been tagged as “It’s Always Sunny in space” … is that an accurate description? Is it that same kind of attitude, same kind of humor as Sunny? I think so. I mean, our humor is our humor, so we can’t change it too much. I recently saw the Reno 911! episode with you and Mary Elizabeth – hilarious. Is that when you two met? No, no, we had met years and years before that. But we’ve always had the same sense of humor, so we enjoy getting to perform together. Had you performed together a lot before that, or before Sunny? No, actually, I think Reno 911! was the first thing on camera, aside from home videos and that sort of thing. But yeah, Reno and then Sunny … I think that was the order. It’s all kind of a blur now. With Charlie proposing to Waitress in The Nightman Cometh, it begs the question: how did real Charlie propose to Mary Elizabeth? Haha, on a beach somewhere … we’ll put it that way. And there was no bright yellow suit involved? Haha, there was no bright yellow suit. And no musical. In The Nightman Cometh episode, and several others, are you actually playing the piano? Yes, I am, I do. Both of my parents are music teachers, and I grew up in a house full of instruments, so I can make noises on a lot of them. And are you the one who writes the music used in The Nightman Cometh? Yeah, I do write a lot of the music. And I brought in a good old friend of mine, a guy named Cormac Bluestone, who’s done a lot of music with us, both on The Nightman Cometh episode and on the Christmas DVD, and various other things throughout the show. And, as always, everything on the show is a group effort, so everyone chimes in with their opinions about things. Maybe I’ll come in with a good jumping off point and then everyone will go from there. Obviously fans love The Nightman Cometh song, and bands are even covering it in concert, but you have been living with it since season two. Is it still fun for you, because everyone else loves it so much, or are you tired of the song? Haha, no, I’m still having fun with it. I don’t have enough of a music career to be sick of any of my music. During The Nightman Cometh tour, you’re performing the entire episode … and what else will we see during the performances? And will people have the chance to interact with you guys at all during the show? (Laughing) I have a feeling people are going to be interacting with us whether we planned it or not. But that’s going to be a part of the joy of the performance, or at least, I hope.